For other uses, see Druzhina (disambiguation). Druzhina, drużyna, or družyna (Slovak: and Czech: družina; Polish: drużyna; Russian: дружи́на; Ukrainian: дружи́на, druzhýna literally a "fellowship") in the medieval history of Poland and Kievan Rus' was a retinue in service of a chieftain, also called knyaz. The name is derived from the Slavic word drug (друг) with the meaning of "companion, friend". The English equivalent is retinue. In early Rus a druzhina helped the prince administer his principality and constituted the area's military force. The first members of a druzhina in Rus Khaganate were the Varangians, whose princes established control there in the 9th century. Soon members of the local Slavic aristocracy as well as adventurers of a variety of other nationalities became druzhinniki. 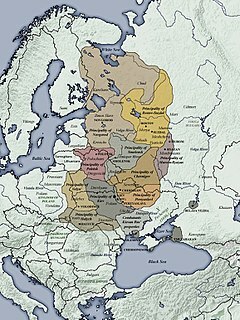 The druzhina organization varied with time and survived in one form or another until the 16th century. The druzhina was composed of two groups: the senior members, later known as boyars, and the junior members. The boyars were the prince's closest advisers who also performed higher state functions. The junior members constituted the prince's personal bodyguard and were common soldiers. Members were dependent upon their prince for financial support, but they served the prince freely and had the right to leave him and join the druzhina of another prince. As a result, a prince was inclined to seek the goodwill of his druzhina by paying the druzhinniki wages, sharing his war booty and taxes with them, and eventually rewarding the boyars with landed estates, complete with rights to tax and administer justice to the local population. 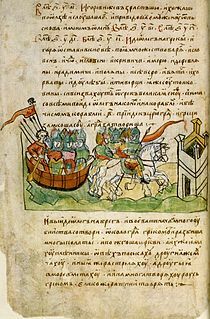 At the Battle of Lake Peipus the army of the Novgorod Republic had about 5000 men in all, and around 3000 men in both the cavalry and infantry were part of Alexander Nevsky's druzhina. Ibrahim ibn Yaqub, who traveled in 961–62 in Central Europe, mentions that the drużyna of Duke Mieszko I of Poland had 3000 men, paid by the duke. Archeological findings at cemeteries in the vicinity of the gord of Ostrów Lednicki, near Poznań, has proven the presence of Norsemen in the area around 10th century, suggesting that they played an important part in the drużyna of Mieszko I, the de facto founder of the Polish state. Mieszko would later marry his daughter Świętosława (Sigrid) to the Danish king Sweyn Forkbeard. Mieszko's daughter would later give birth to Cnut the Great, king of Denmark, Sweden, and Norway – as well as a conqueror of England. It is likely that the Polish-Norse relationship was a result of earlier trade and cooperation. Unlike his predecessors, Casimir I the Restorer promoted landed gentry over the drużyna as his base of power. ^ "Online Etymology Dictionary". www.etymonline.com. Retrieved 13 May 2017. ^ Zeno. "Drushine". www.zeno.org. Retrieved 13 May 2017. ^ "druzhina - Russian history". Retrieved 13 May 2017. ^ "Kievan Rus - historical state". Retrieved 13 May 2017. ^ "Druzhina". Retrieved 13 May 2017 – via The Free Dictionary. Casimir I the Restorer, was Duke of Poland of the Piast dynasty and the de jure monarch of the entire country from 1034 until his death. A boyar was a member of the highest rank of the feudal Bulgarian, Kievan, Moscovian, Serbian, Wallachian, Moldavian, and later Romanian aristocracies, second only to the ruling princes from the 10th century to the 17th century. The rank has lived on as a surname in Russia, Ukraine and Romania, and in Finland, where it is spelled Pajari. Sviatopolk I Vladimirovich was the Kniaz' (Turov) of Turov (988–1015) and Velykyi Kniaz or Grand Prince of Kiev (1015–1019) whose paternity and guilt in the murder of brothers are disputed. 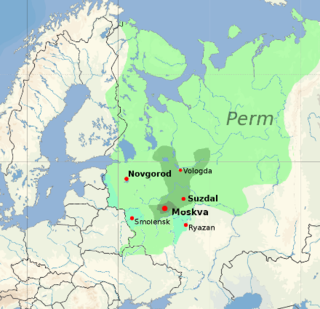 The Cherven Cities or Cherven Grods, often literally translated as Red Cities | Red Forts | Red Boroughs, was a point of dispute between the Kingdom of Poland and Kievan Rus' at the turn of 10th and 11th centuries, with both sides claiming their rights to the land. Leszek the White was Prince of Sandomierz and High Duke of Poland during 1194–1198, 1199, 1206–1210, and 1211–1227. During the early stages of his reign his uncle, Duke Mieszko III the Old, and cousin Władysław III Spindleshanks, from the Greater Polish branch of the royal Piast dynasty, contested Leszek's right to be High Duke.